Welcome to Maui and our beautiful upgraded 1 bedroom, 3rd floor condo – C307 in Kihei Alii Kai. We are in the upper building on the "quiet side of the complex", close to the parking lot and elevator access. We boast a very large Lanai with a beautiful quiet view as we are on a private road with off street parking and elevator to the 3rd floor. We also have a beautiful pool, jacuzzi, and sauna on property with BBQ's and a tennis court just steps from our condo. Our wonderful KAM 1 beach is just a very short walk down our road along with coffee shops, restaurants, grocery shopping, Boss Frog rental, and many other fine facilities. Upgraded kitchen with all amenities, Queen size bed with closet and dresser space, ceiling fan and floor fan. Living room has wonderful trade winds when you open the lanai door, but there is also A/C if needed. Washer and dryer are also inside the condo. Bathroom has both a Tub and Shower for your pleasure. Start your morning on the lanai with Maui coffee or a walk to the local bakery for a fresh cinnamon roll, or one of the several coffee shops, then off to the beautiful KAM1 beach. There are beach chairs, mats, and beach towels for your personal use. There are so many other activities on Maui, just ask and I will help you plan what to do. In the evening sit on the large lanai with a Hawaiian cocktail and watch the sunset, cook on the BBQ just steps from our condo, then head for the pool, sauna or jacuzzi and meet new friends, or head out to one of our favorite places for evening music. Big 50' HDTV, games, cards, books, DVD/IPod player and more if you choose to spend time inside. Free secure WiFi and long distance calling. I was raised in Oregon and made my first trip to the islands in 1967. I immediately fell in love with Maui and after many more trips knew I would one day have a 'second home' on Maui, which happened on one of my trips in 1999! My husband and I were married on the beach in front of Mama's Fish House in 2005 and come over every year to enjoy and update our condo. I manage all bookings personally and love talking to my future and especially returning guests. We have made many friends over the years and they 'welcome us home' each time we arrive. They are truly our 'second family'. I was visiting with friends in 1999 when I started looking for condos and fell in love with C-307 at Kihei Alii Kai. While boarding the airplane to come home, I received a call that the owners accepted my offer and I was going to own 'my condo in paradise'. I have traveled to many places and the people in Hawaii are by far the warmest, most friendly, loving, people I know. We make new friends on every trip. We love sitting on the lanai, it is very large, nicely furnished and so quiet and peaceful with a lovely view. Since the BBQ is on the same level and steps from the condo, you can enjoy dinner on the Lanai even thought there are many wonderful restaurants close by. KAM I beach is just a very short walk, about 150 feet from the condo and so beautiful for walking, snorkeling, swimming, and sun bathing. In the evening we enjoy watching the Sunset and then going to the Jacuzzi and meeting new friends. There is also the Maui bus you can hop a ride on or check on the many activities that Kihei has to offer. Nice Hawaiian decor in bathroom with both Tub and Shower. Hair dryer on wall and magnifying mirror for putting makeup on. Short walk to KAM 1 beach. West Maui mountain range from lanai, Haleakula from the picnic tables. Nice 'mini' ocean view from Lanai. Cools unit quickly if needed. Off street parking, close to elevator and stairs. Off street parking next to the elevator. Fully stocked for 4 people. Updated kitchen with Granite counter tops and all items needed to whip up a meal. Tables next to the BBQ and Tennis courts or pool area for an outdoor picnic or meal. Locked gates for KAK guests only. Well maintained and locked gate for guests only. New 50' HD TV and CD/DVD player. Nice Hawaiian decor. VERY quiet street, sit on Lanai with coffee or your laptop using the free WiFi. Condo kitchen is fully equipped for preparing gourmet entrees, if you chose. Refrigerator has ice maker and there is a blender for your Hawaiian cocktails. There is also a gas BBQ available 25 feet from the front door of the condo and another one by the pool. Check the cupboards for leftover spices, etc. before shopping. Elevator within 10 feet of parking. The tradewinds keep the condo nice and cool, but there is an exceptional air conditioner if needed. The bedroom headboard is next to a window that is on a walkway that many people use since this unit is close to the elevator. Their voices are very loud in the bedroom even when these people talk normally. Parents calling after their kids is worst. And of course there is little privacy. This host is terrible at communications. It took several e-mails and two phone calls on the 2 days before our arrival to finally get the lock box number. Her 4-page contract (which you have to sign) says she will send that information 2-weeks before arrival. She did not do that. She also charges the credit card fees so be sure to add that $35 to you total cost. 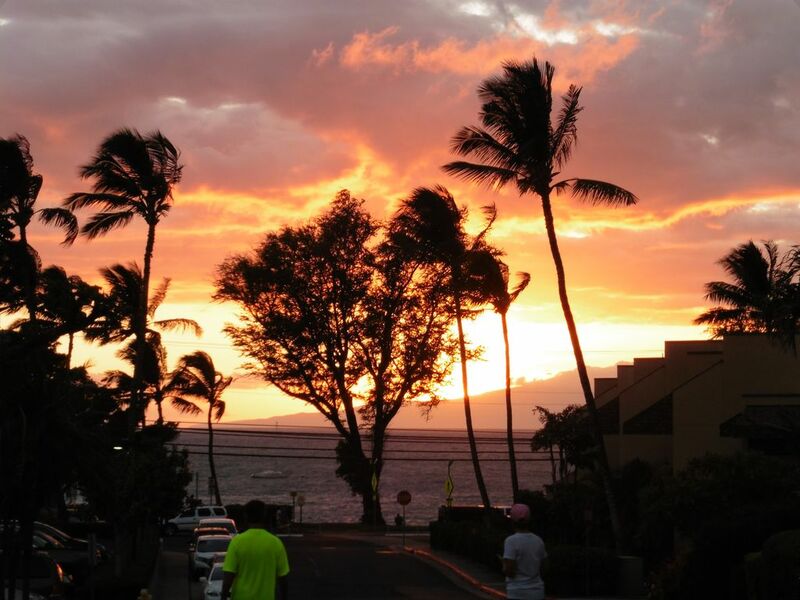 There are many good places to stay in this area of Kihei. We will not be coming back to this place. Bob I am sorry you did no enjoy your stay in our condo. When you informed me your wife was in a wheelchair I told you there was an elevator right from the parking lot to my condo and we do have a 10PM quiet time. When we spoke I let you know I would be taking whatever fees Homeaway charged me, for using VISA, out of your deposit., which was for you $35. This is also stated in my contract that I ask all guests to sign. I did goof and didn't send you the lockbox code 2 weeks before and apologized for that mistake. Good idea to try a different complex for your next stay. The condo is beautifully designed, well kept and conveniently located at the walking distance from a nice beach, shops, restaurants, coffee shops, a whole foods store with a good non-expensive cold and hot buffet. You can find in the condo everything you need and much more. We had a very pleasant stay there. First visit to Maui, very impressed with our condo and endless amenities! Would love to return! Great condo for 2, 4 could work but it would be cozy. Lovely condo, great pool and so close to the beach, shopping and dining. Thank you for your response and we look forward to having you stay with us again. We love Kihei and visit at least every other year! We were very happy with our stay at Don and Elaine's place! It was perfectly located to all of our favorite places! It had all the amenities that we needed - including beach chairs and an umbrella (things we normally would need to rent). The accommodations were great, and the kitchen was spacious. We were careful not to use the air-conditioning much (since we knew it was expensive), but that made it rather warm at times. We would definitely recommend this place! Toni and Brett it was our pleasure to have you as guests in our condo and we hope you will be back next year. I am happy you found that we still had many "beach toys" there for your use and pleasure. Thank you for choosing our condo. We were in Maui for 18 days in may June This was our fourth stay in this condo . The Condo has everything you need and more The location is just a short walk to the beach and the bbq is just 20ft from the door . Thank you Wayne and Lena for your nice words and I know as we have talked on the phone that you really enjoy the changes we make to our condo each time you stay. I look forward to the next time you stay with us as you always leave the condo in wonderful shape and it is a pleasure hearing from you. Tax ID -W30277236 Credit cards accepted, guest pays credit card fees charged by VRBO/HomeAway Ask about discounts, for bookings over 28 nights. Late Check-Out rate available. Check in at 3:00pm Check out 10:00am Cleaning fee charge of $100 if less than 5 night stay. Cancellation Fees - if less than 60 days, $250 deposit is forfeited, unless reservation is re-filled, then $125 will be refunded, or a pro-rated amount for number of days filled.